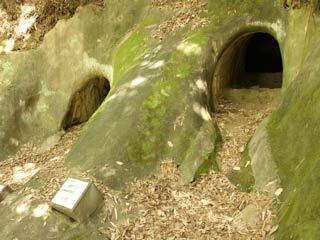 Ichigao Catacombs (市ヶ尾横穴式古墳) is a cavern style tumulus, also known as Yokoana Kofun. There are 9 catacombs in this park. There is no parking. There is a restroom. 1. use JR Yokohama Line to Nagatsuda. Rich farmers were buried in there in Kofun era. There are 19 of these graves, called Yokoana, located in the hills where the Tsurumi River begins. THese Yokoana can be grouped into several types by their interior design. In 1933 and in 1956, things such as arms, accessories and pottery were discovered in the yokoana. As many other ruins were discovered around Ichigao and Eda, it seems that the area was a center of the ancient Tsuzuki country.